These mooring lines are constructed from Kingfisher Dockline. 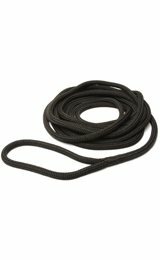 Dockline is a braided mooring line; it has a polyester cover and a braided nylon core. Due to the construction of the rope it has a good abrasion resistance while also being very strong and comfortable to handle. The Breaking strain of 16mm dockline is 6700kg. Every line is professionally spliced and the end of the rope is professionally whipped leaving a clean and tidy finish.